Amtrak investigators inspect the deadly train crash in Chester, Philadelphia. TWO PEOPLE DIED after an Amtrak train struck a piece of construction equipment just south of Philadelphia causing a derailment. More than 30 others were sent to hospital, authorities said. Train 89 was heading from New York to Savannah, Georgia, at around 8am when it hit a backhoe that was on the track in Chester, about 15 miles outside of Philadelphia, officials said. The impact derailed the lead engine of the train, which was carrying more than 300 passengers and seven crew members. Chester fire commissioner Travis Thomas said two people were killed, but neither was a passenger on the train. Authorities provided no additional information on the fatalities. Thomas and Amtrak officials said more than 30 people were taken to hospitals with injuries that weren’t considered life-threatening. The National Transportation Safety Board is investigating. Officials with the Federal Railroad Administration were also sent to the scene, said Matthew Lehner, a spokesman for the agency. Ari Ne’eman, a disability rights activist heading to Washington after speaking at an event in New York, said he was in the second car at the time of the crash. “The car started shaking wildly, there was a smell of smoke, it looked like there was a small fire and then the window across from us blew out,” said Ne’eman, 28. Some of the passengers started to get off after the train stopped, but the conductor quickly stopped them. Officials started evacuateing people to the rear of the train and then off and to a local church. 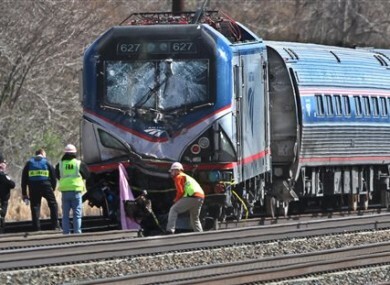 Email “Two dead as train hits digger near Philadelphia”. Feedback on “Two dead as train hits digger near Philadelphia”.